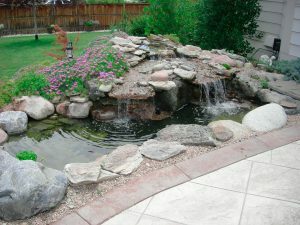 The pond design and installation team at A Perfect Landscape provides everything required to bring your ponds, waterfalls, and custom water features to life at your Denver-area residential or commercial property. Our local landscaping contractors help our Denver clients transform their outdoor living spaces by creating the perfect outdoor water features, ponds, and waterfalls. 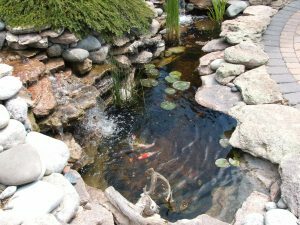 You can be certain that whether you would like a simple koi pond in your backyard, or an elaborate system of waterfalls and fountains included in your pond designs, A Perfect Landscape will utilize years of expertise in the pond landscaping process. When you are searching for a pond landscaping and design company to bring your vision of an outdoor oasis to life, it’s important to choose landscapers who understand the Denver terrain and environment. Colorado’s natural landscape and climate is perfect for ponds, waterfalls, and other water feature accents, which makes pond installation quite popular among both residential and commercial landscaping clients. However, due to the drastic changes in seasons, you have to make sure your pond installation is performed correctly and designed to be easily maintained and set up/shut down throughout the changing seasons. A Perfect Landscape’s pond landscaping professionals make sure your pond design ideas are reflected, while also providing the proper installation so your custom ponds, fountains, and waterfalls are easy to take care of throughout the year. 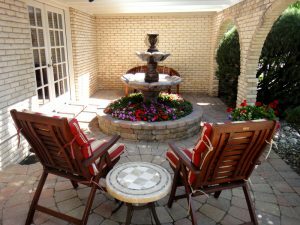 Custom ponds, water gardens, and water features, such as waterfalls and fountains, can add beauty and value to your Denver home or commercial property. Whether you choose a natural pond design or prefer more contemporary water features, custom pond designs give a distinctive accent to your landscape. A well-designed pond creates a serene, inviting place to sit and enjoy a book, meditate, or educate your children on the mini-ecosystem within your pond. Our water features and custom ponds can be built to fit any size, shape, or unique design. We build custom pond landscape designs that blend seamlessly into the surrounding area. Do you want a quiet place to channel your inner peace? Try a koi pond with a natural rock bottom, complimented by a natural rock waterfall. Perhaps you’re looking for something more decorative? Try an ornamental pond with an elaborate fountain. Our custom pond features can include an outdoor lighting solution within your pond to allow for an even more spectacular nighttime view. Worried about the pond installation cost? A Perfect Landscape offers practical, affordable pond landscaping, with free estimates to ensure you are comfortable with the pond landscaping project before any work is done. Our landscaping contractors ensure proper planning for the installation of your custom pond design, and can give you a pond that brings joy, serenity, and relaxation for years to come. Give our Denver pond landscaping team a call at (720) 851-3034 to discuss how our custom pond design and pond installation services can help you build a stunning outdoor living space that you’ll want to enjoy year-round!